Photos courtesy Xenia Community School District The Xenia Community School District Board of Education honored its January kids of character Jan. 14. Pictured with Superintendent Dr. Gabe Lofton and board president Dr. Robert P. Dillaplain are Thomas Leightenheimer (preschool), Alexia Barlow (Cox Elementary), Gracie Neff (McKinley Elementary), Kyndall Howard (Tecumseh Elementary), and Kymari Sanford (Warner Middle). Not pictured are Lacie Murnahan (Arrowood Elementary) and Samari Curtis (high school). Anna Welch from Shawnee Elementary School was honored for being a kid of character. She is pictured with Superintendent Dr. Gabe Lofton. 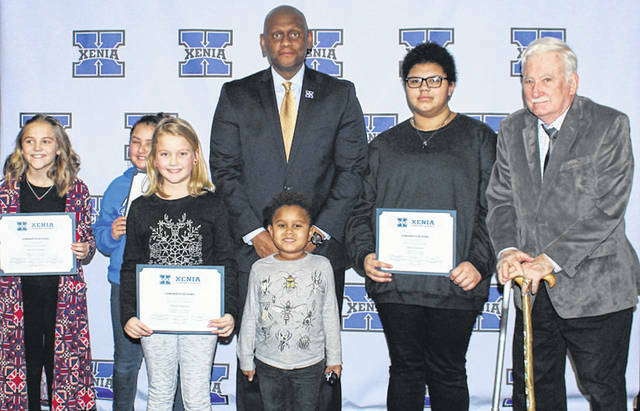 XENIA — The Xenia Community School District Board of Eduction honored its January kids of character Jan. 14. Recognized were Thomas Leightenheimer (preschool), Lacie Murnahan (Arrowood Elementary), Alexia Barlow (Cox Elementary), Gracie Neff (McKinley Elementary), Anna Welch (Shawnee Elementary), Kyndall Howard (Tecumseh Elementary), Kymari Sanford (Warner Middle), and Samari Curtis (high school). Leightenheimer is a kindergartener in Brittany Phipps’ class. He works hard in everything he is given. He is a great friend and is always ready to encourage. Leightenheimer is responsible for his things, respectful to those around him, and helpful in class. He greets everyone with a smile and a hug and comes to school excited to learn each day. Howard is a student who shows great responsibility. She organizes herself for class, knows what is expected of her each day, and accomplishes all the tasks given to her. Howard gracefully keeps up with all of her commitments. She is responsible for keeping up with classwork when she is out of the room for XTAR. Howard is a Student Ambassador who has many responsibilities for her school and community. She works in the office at the end of the day and is so responsible that secretary Jennifer Claus can trust her to deliver things around the school building. Sanford is a quiet and very thoughtful student. She carries A’s across the board and her work is excellent and carefully done. She takes advanced English language arts (ELA) and math classes and she is always on task. She participates in the Novel Writing Group after school and the novel she is writing has depth and is extremely well written. Sanford is one of those students who is truly a pleasure to have in the classroom because she is positive and compassionate. https://www.xeniagazette.com/wp-content/uploads/sites/32/2019/01/web1_IMG_1722_ne201911522323166.jpgPhotos courtesy Xenia Community School District The Xenia Community School District Board of Education honored its January kids of character Jan. 14. Pictured with Superintendent Dr. Gabe Lofton and board president Dr. Robert P. Dillaplain are Thomas Leightenheimer (preschool), Alexia Barlow (Cox Elementary), Gracie Neff (McKinley Elementary), Kyndall Howard (Tecumseh Elementary), and Kymari Sanford (Warner Middle). Not pictured are Lacie Murnahan (Arrowood Elementary) and Samari Curtis (high school). https://www.xeniagazette.com/wp-content/uploads/sites/32/2019/01/web1_IMG_1726_ne201911522324748.jpgAnna Welch from Shawnee Elementary School was honored for being a kid of character. She is pictured with Superintendent Dr. Gabe Lofton.